Trevor Craport (2015 Bucks) plays in the Baltimore Orioles organization. Eleven former Brookhaven Bucks played professional baseball in 2017 (AA, A and independent leagues). Take a look at how they did! 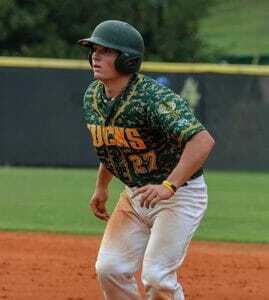 3B Blake Butcher (2017 Bucks), a LaGrange College graduate, played three games for the Bucks at the beginning of the 2017 season before signing a professional contract with the High Desert Yardbirds of the California-based Pecos League. Butcher hit .308 and helped the Yardbirds win the Pecos League Championship. 3B Trevor Craport (2015 Bucks) completed his junior year at Georgia Tech this past spring. In June, he was drafted in the 11th round by the Baltimore Orioles in the Major League Baseball First-Year Player Draft. He signed and played for the Aberdeen IronBirds in the “Short-Season A” New York-Penn League. Craport hit .302 and led the team in doubles (15) and triples (3). RHP Jonathan Fleckenstein (2015 & 2016 Bucks), a LaGrange College graduate, helped the High Desert Yardbirds (Adelanto, CA) win the of the Pecos League championship. “Fleck” was 4-0 with a 3.24 ERA for the season. LHP Sean Guenther (2014 Bucks) completed his junior season at Notre Dame in 2017. He was selected in the 7th round by the Miami Marlins in the Major League Baseball First-Year Player Draft. Guenther had a 3.18 ERA in 51 innings of work for the Gulf Coast League Marlins (Rookie level) and the Batavia Muckdogs (“Short-Season A” New York-Penn League). OF London Lindley (2013 & 2015 Bucks) hit .291 and stole a team-best 24 bases for the Southern Illinois Miners (Marion, IL) in the Frontier League. OF Josh Merrigan (2013 Bucks) played 20 games for the Burlington Bees (Los Angeles Angels “A” affiliate) in the Midwest League and 29 games for the Joliet Slammers (Frontier League). During his time with the Slammers, Merrigan led the team in hitting with a .333 batting average. 3B/1B Matt Rose (2013 Bucks) played 65 games for the Myrtle Beach Pelicans (Chicago Cubs “A” affiliate) in the Carolina League and led the team in home runs (15). In July, Rose was traded to the Chicago White Sox and hit .270 in 36 games for the Winston-Salem Dash in the Carolina League. LHP Will Solomon (2014 Bucks) played his second season with the Fargo-Moorhead Redhawks in the American Association of Independent Professional Baseball. Solomon had 5 wins, 2 saves and a complete game for the Redhawks. RHP Kevin Steen (2014 Bucks), a member of the Boston Red Sox organization, spent the 2017 season on the disabled list. RHP Touki Toussaint (2014 Bucks) pitched in 26 games for the Atlanta Braves organization this season. With the Florida Fire Frogs (“A” level) in the Florida State League, he had 123 strikeouts in 105.1 innings pitched. With the Mississippi Braves (“AA” level) in the Southern League, he had a 3.18 ERA and 44 strikeouts in 39.2 innings pitched. Touki will be playing for the Peoria Javelinas in the Arizona Fall League (October-November). 1B Nic Wilson (2012 Bucks) played 27 games for the Birmingham-Bloomfield Beavers (Michigan) of the United Shore Professional Baseball League. He hit .271 and led the team in home runs (8) and RBI (26). This entry was posted in News and tagged Bucks Alumni. Bookmark the permalink.